The common man now resides in troubled times therefore, protection of family, friends and individual property becomes necessary and sometimes may also involve the use of firearms. With proper documents and intricate knowledge about the weapon, one can purchase guns and keep the same in their homes under lock and key for future applications under demanding situations. When it comes to storage of a firearm, one should always store the weapon in a gun safe or a gun cabinet. The terms gun safe and gun cabinet are often confused among the masses but they are actually different both in terms of functionality and features. This article will be shedding some light on the difference between a gun safe and a gun cabinet all the while focusing on their respective features and benefits. The protective container used by individuals to safely store firearms, ammunition and related accessories are called gun safe. These enclosures are mainly utilized by the masses to safely store their weapons and keep them from unauthorized or even illegal use by ill minded people. If you have kids in your household and infants who have just started to explore their surroundings, keep them safe by storing away your firearm in a gun safe. Gun safes are also used to keep advanced and antique firearms protected from the elements in case there is a flood, natural disaster or even a case of fire. There are certain features that one needs to look for while opting for a safe that ensures the safe keeping of your gun. Some of the necessary features are discussed below. The locking mechanism of the gun safe is the most important aspect as it is the first line of defense against any abuse that tries to open the same to access the firearms within. Gun safes these days are either offered with a traditional dial lock mechanism or even an electronic circuitry with advanced biometric access that takes up the security factor of the safe a notch higher. The second layer of defense is the bolt mechanism incorporated in the safe. A minimum of three bolts is necessary on the sides of the safe that adds to the overall strength factor of the safe. One should always look for gun safes that are certified by ETL or UL fire rating. This is calculated based on the following criteria; a safe offers Y minutes of fire resistance at X degrees Fahrenheit. A safe that can hold its integrity and keep your guns safe for 30 minutes or longer in a case of a house fire, where the temperature soars up to 1,200 degrees Fahrenheit, make the same an ideal product. The insides of a safe are always lined and made with pure steel with a minimum of 10 to 12 gauge thickness. This feature prevents the criminals from drilling away on the safe and getting access to the armory. While looking at reviews for gun cabinets, one should not get confused between a gun safe and a gun cabinet. There is no exact difference between the two in terms of appearance and definition but some technical specification does set them apart. A gun cabinet is similar to that of your kitchen or cutlery cabinet that is mainly used for showing off your gun collection all the while being behind a glass door of the cabinet. A built in cabinet or a free standing cabinet are the two modes in which gun cabinets are made available in the market. Custom made, built-in cabinets fixed into position during installation are ideal for security reasons. The gun cabinets are equipped with base attachments that act as a support for the whole enclosure. The cabinets are equipped with adjustable leg attachment that adds to the convenience factor of the same. Gun cabinets usually come pre-equipped with one single compartment, but he same can change as per the number of guns you want to store/display. The compartments can be either open shelved or enclosed in glass depending on your taste and setting. The modern day cabinets employ more complicated and advanced means of technology for browsing ease. Gun safes are the sturdy, strong and heavy duty metallic containers used by individuals to safe keep their guns, ammunition, and other related items under lock and key from illegal usage and accidental discharge by kids. Firearms that hold both sentimental, as well as economic value due to their vintage nature or rarity, are generally kept in gun safes. These remarkable yet simple enclosure made of metal is also used by individuals to safe keep advanced and technologically superior, modern day firearms from accidental harm by the elements such as water from flood, house fires, and even natural disasters. Of course, safes that offer the user with fire and disaster proof features cost a little more, but it is worth every penny if you want to keep your armory secures. Bolt layout and the locking mechanism of the safe add to both the cost as well as the security factor of the safe. Gun cabinets, on the other hand, don’t have an exact definition for the same. 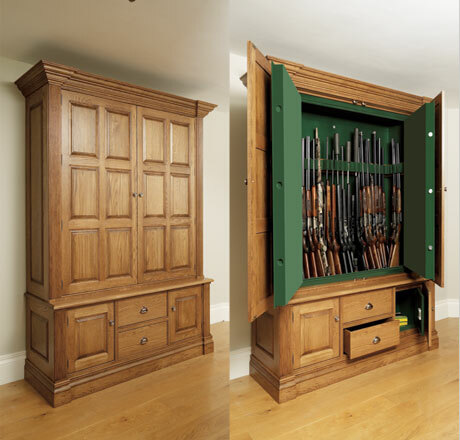 In terms of appearance, safety and security features, a gun cabinet lies in the shadows of the gun safe. A cabinet made for guns are usually manufactured from materials where wood is the main component. Gun cabinets are mainly used for displaying the armory in a shop, or in a more private setting to your friends. To round it all off, gun cabinets doesn’t offer the safety and security of a gun safe and the latter succeeds over the former in terms of performance and utility. ← How to break into a gun safe?